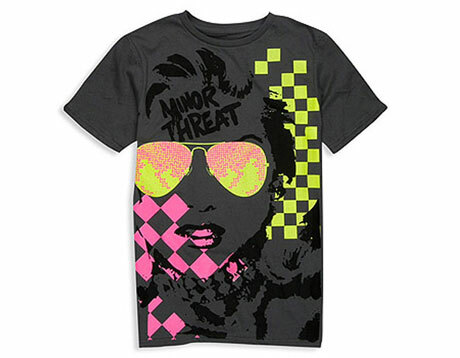 Once again, it appears a company is using and abusing the artwork of Minor Threat. The culprit this time? Skinny teenage clothing retailer Forever 21 has been caught selling a T-shirt bearing a strikingly similar logo to that of Minor Threat's 1983 album, Out of Step. The offending T-shirt was originally called out by the blog You Thought We Wouldn't Notice and has since led to a statement from Minor Threat's label home of Dischord. In it, the label says the use of the logo is indeed unauthorized and falls under the "'unacceptable' category." The label went on to say it was looking into the matter and would be asking Forever 21 to cease and desist. This latest incident of copyright infringement is hardly the first for Minor Threat. In 2005, Nike copied the cover of the band's first EP in its campaign "Major Threat," and was forced to issue an apology following a backlash from fans and the group's Ian MacKaye. Also in 2005, Fox ran into trouble with Dischord after using a snippet of Minor Threat's "Salad Days" during an NFL broadcast, again without the band's permission. This is an unauthorized shirt and it is still unclear whether the shirt was produced by Forever 21 or if it is a bootleg that they just happen to carry. Either way, the members of Minor Threat are looking into it and Forever 21 will be asked to stop selling it. The band and the label tend to deal with bootleg shirts on a case by case basis, acknowledging the vast difference between kids screening shirts for friends and professional printing studios screening shirts for profit. Obviously this absurd Forever 21 shirt falls under the 'unacceptable' category.